3 Days Dry Fly Fishing for $300 – Is it possible? 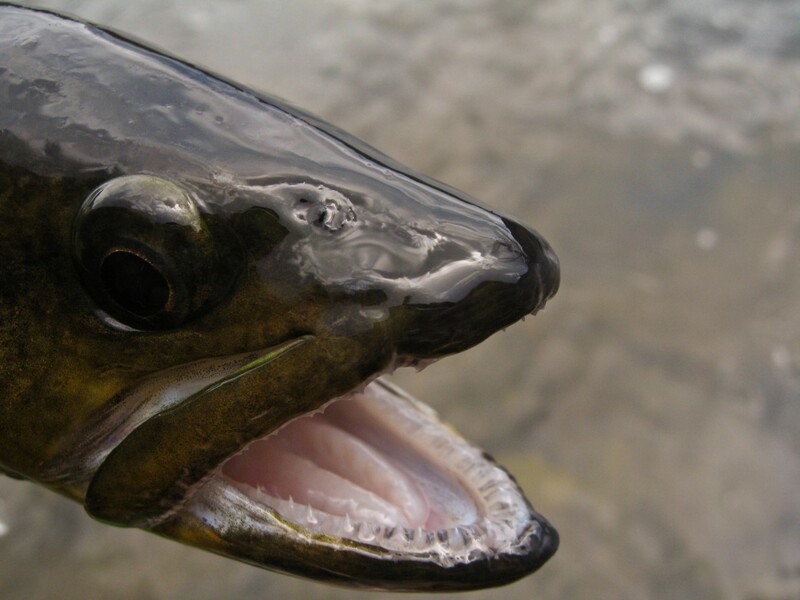 My fishing partner recently renewed his subscription to a particularly well known Fly Fishing publication and mentioned how disappointing it was to find the majority of articles focused on exotic locations where fly fishing came at a premium. So we talked about finding some good quality fly fishing on a shoestring budget and the possibility of three days dry fly fishing on a World Class trout river for around $300 each. We didn’t want just any old river, what we wanted was fly fishing on a Western Freestone River for $300! So which destination to choose? The nearest Western State to our portion of Missouri is Colorado and a river that fits our requirements for its Freestone nature and insect populations is the Arkansas. We had previously fished the Arkansas in both May and September finding it provided good dry fly fishing before and after run-off. Those occasions on the water had provided knowledge of the stream and would eliminate the need for “exploration” thereby maximizing our fishing time. A check of a Salida Fly Shop’s website showed that the fishing was “picking up” and run-off flows had not increased to unacceptable levels. BWO’s had been sighted throughout the river system and rising water temperatures gave the hope of Caddis. The fact that the fabled “Mother’s Day Hatch” takes place in early May (the month of our trip) was also influencing our decision. Destination decided the next decision was transportation. Flying from our local airport to Denver is direct and relatively inexpensive at around $200 per person round trip. Of course there would still be the need to rent a car which would bump our expenses up by something in the region of $200-300. The problem was that our budget would be eaten up by transportation alone if we chose that method! So what about driving out and back in our own vehicle? A quick check of “Google Maps” showed it to be roughly 770 miles to Salida with a driving time of slightly less than 14 hours (non-stop). Were we up to sitting in a car for that amount of time – twice? It just so happened that my fishing partner had recently purchased a fairly new Toyota Corolla which returns a pretty good gas mileage. He was happy to take it on the trip and we estimated about $150 in gas for the round trip. A heck of a lot cheaper than the combined air fare and car rental! To maximize the trip and cut down on hotels we decided that outward and return journeys would be accomplished in one day each with three full days of fishing in between giving a total of five days away. The next decision was accommodation and that proved to be easy. Having stayed in Salida before and we knew of a reasonable motel with rates of $60 per night for a double room. We thought it would ease the strain if we stayed the first and last night on the eastern side of the Rockies. This would allow us to drive upstream on our first morning to see if the Caddis had made an appearance at the lower elevations and also give us a jump on our journey home. A couple of phone calls secured two more hotels, one in Cañon City ($70) and one in Pueblo ($60). Of course there would be a need to eat! Breakfast was included at all the hotels and lunch would be our old standby of a Subway sandwich from the shop in Salida. Dinner was quickly solved by an authentic Mexican restaurant in Salida having great food at low prices. So eating was going to run us about $20 a day each. Incidentals like bottled water, granola bars and a three day fishing license was estimated at about $40. So how did our budget shape up? It looked like it was going to cost each of us $75 for gas, $125 for hotels, $100 for food and $40 for incidentals giving a grand total of $340. We were close enough to our budget so the trip was on! Long drives across country can be awfully boring and we usually solve this by taking a “Talking Books”. For this journey the choice was a swashbuckling novel about 19th century soldier fighting in the Napoleonic Wars. The 14 hour drive necessitated an early start to ensure we didn’t arrive so late at our destination that the following day would be a “recovery” day. We decided to leave home at 6am with a planned arrival of around 9pm providing a good night’s sleep before hitting the stream the following day. The journey across the mid-west section of the USA went very smoothly with “Sharpe’s” exploits helping the miles pass quickly on un-crowded roads. A change of drivers every couple of hundred miles ensured we stayed alert and even the Feed Lots didn’t bother us too much although I swore to avoid red meat in future! Arrival at Cañon City was roughly on schedule and having already eaten, we only needed to pick up a few supplies and purchase our fishing licenses. Breakfast the next morning was at 6am and we then began our drive along the Arkansas following my river map. 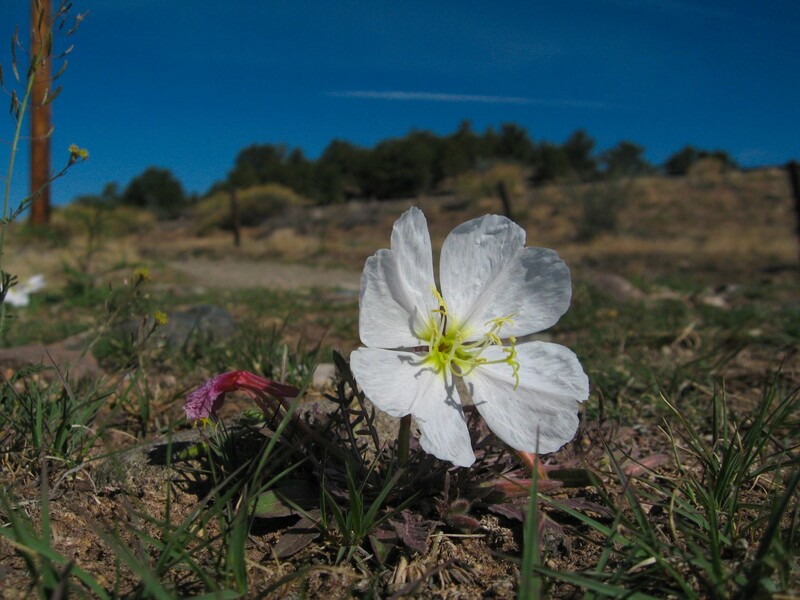 Our plan was to work the section above Royal Gorge known as Big Horn Sheep Canyon which provides about 17 miles of fishable water. Thirty minutes drive found a nice section that provided some good runs and a couple of flats we located a pull-out and began to tog up. We were just pulling on our wading boots when the sound of boulders crashing down the mountainside grabbed our attention. Thankfully our parking area was across the highway from the mountain so we felt reasonably safe but it was still rather startling. To our amazement the cause of our localized landslide was a herd (not flock) of Big Horn Sheep making their way along the canyon rim. The rocks tumbling down the mountain were being dislodged by the sheep as they nimbly negotiated the terrain. A fishing trip is never complete without maybe an Eagle perched in a tree or possibly deer crossing the stream, although this was a first for both of us and certainly added that extra element we always hope for. The water was running at its pre run-off rate of around 270cfs giving fairly easy wading and the ability to cross the stream with care. Water temperature was sitting at 52 degrees so a little cool at that time of morning for the Caddis. The sun was shining so we expected the temperature to rise giving the possibility of a mid afternoon or early evening hatch. Clarity of the water was our biggest concern and a quick discussion had us back in the car and heading upstream to reach an area above the two main streams that enter the Arkansas. A few miles south of Salida are some nice sections of public water giving plenty of opportunities for us to work the river across from each other as we fished our way upstream. Along this section we did find better water clarity above the two side streams although the temperature was still a little chilly for Caddis. It didn’t take long for us to see that BWO’s were on the water, albeit in small numbers, and that the fish were taking them in the back eddies and slower runs. So fly selection was determined and with shorter casts being the order of the day we selected 4 weight rods. We decided on 9 foot 5X leaders with a 12 inch section of 5x Fluorocarbon tippet to provide a “predator” tip for protection from those Brown Trout teeth. So began the first of what turned out to be three amazing days of dry fly fishing on one of the longest Western Freestone Rivers. The Caddis never did make an appearance although the BWO’s certainly made up for this. It did take some time for our eyes to acclimatize to spotting our #2o foam post BWO dries bobbing around in the foam flecked water of the Arkansas. 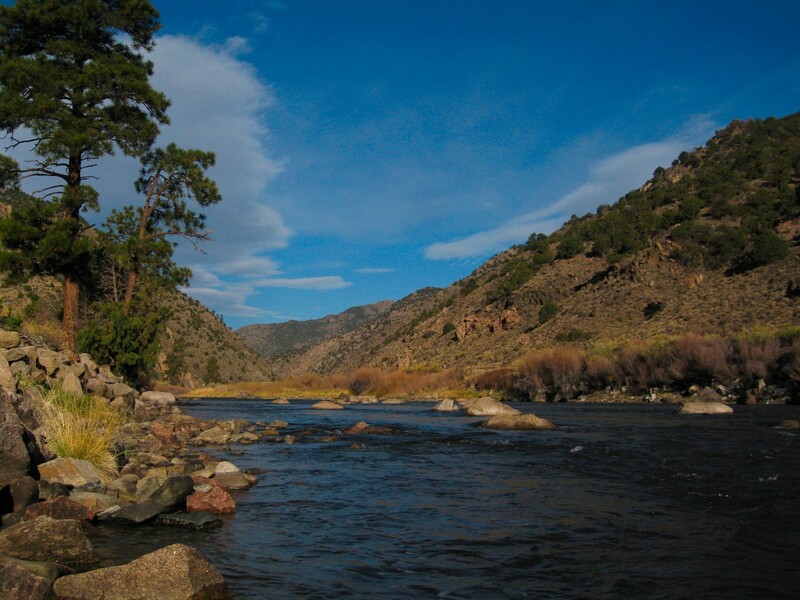 The Arkansas River is not renowned for its large Brown Trout although it does make up for this in the number of fish per mile and the strength of the fish. An average Brown will be about 14 inches although the occasional “monster” will stretch the tape to 18 inches. Rainbows are also in the river and these do err on the larger side. On this occasion the Arkansas did yield a 24 inch Rainbow which I took from its holding lie under an overhanging rock in a back eddy where it thought it was secure. Fishing pressure was average with other wading fly fishers to be found and some guided raft trips passing us fairly quickly. We never felt crowded and most of the time we only saw other waders in the parking areas as we kitted up. The ability to make short casts and often in windy conditions is of primary importance on the Arkansas. In my case I chose a Double Taper line to provide accurate casts and the ability to turn over flies at these short distances. Indicator dry flies like foam post are particularly helpful with those smaller flies although we found the “takes” to be positive and recognizing this will yield plenty of fish. A word of warning about the Arkansas! The rocks are treacherous and a wading staff is essential if you are planning on covering the water on foot. Studded boots help although some rocks appear to be “glazed” and studs actually make wading more difficult. One day I will try aluminum cleats which have a better gripping ability on granite boulders. During our three days on the river we encountered BWO’s almost the whole time and although we didn’t always see feeding fish, a well placed fly would generally produce an eager fish. Sight fishing was always possible and often produced the best fish including that 24 inch Rainbow. While you are stumbling around in the Arkansas (and any river for that matter) take the time to pause and look around. 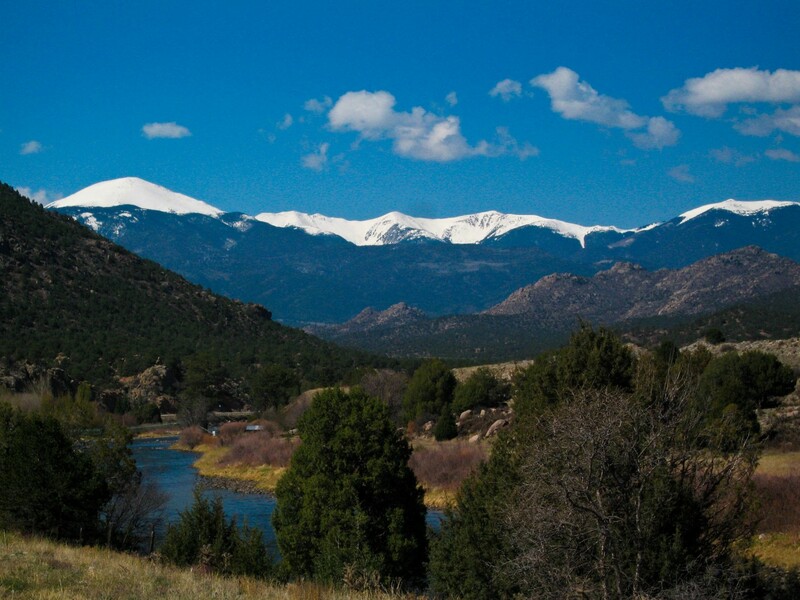 The scenery is beautiful and the chance of seeing such creatures as Elk and Big Horn Sheep is always possible. On previous visits to the Arkansas we have even seen paw prints of Mountain Lions and Bears! When the time came to leave we were suitably pleased with our success in catching numerous fish on dry flies throughout the three days we spent on the Arkansas. During the same period we witnessed and heard from other fly fishers who had less luck although it would appear they didn’t recognize the subtle presence of our little BWO friends and concentrated their efforts in casting streamer flies. The drive back across Eastern Colorado and Kansas passed by fairly quickly aided by further exploits of our good friend “Sharpe” and we arrived back in Missouri by early evening on our fifth day. We both agreed that a 14 hour drive was “doable” and it would figure in our future plans although more distant destinations may still require a plane ride. Total expenditure for the trip actually turned out to be $320 each, so very close to our budget and making the option of repeated trips more likely. Of course experience and some luck played a part in our success. Foreknowledge of the stream was a big help in deciding places to access the water although one can aid this by purchasing a river map and paying a visit to a reputable fly shop with experienced staff. The weather was also on our side giving us good fishing conditions. We found out later that following our departure the higher daytime temperatures had precipitated the annual run-off taking the flow and clarity to less than desirable levels so our timing was impeccable. So who needs Chile or Kamchatka when your bank balance is going to drop by thousands of dollars! Pull out the map and see what rivers are within a 14 hour driving range, you might be pleasantly surprised what a little planning can achieve! 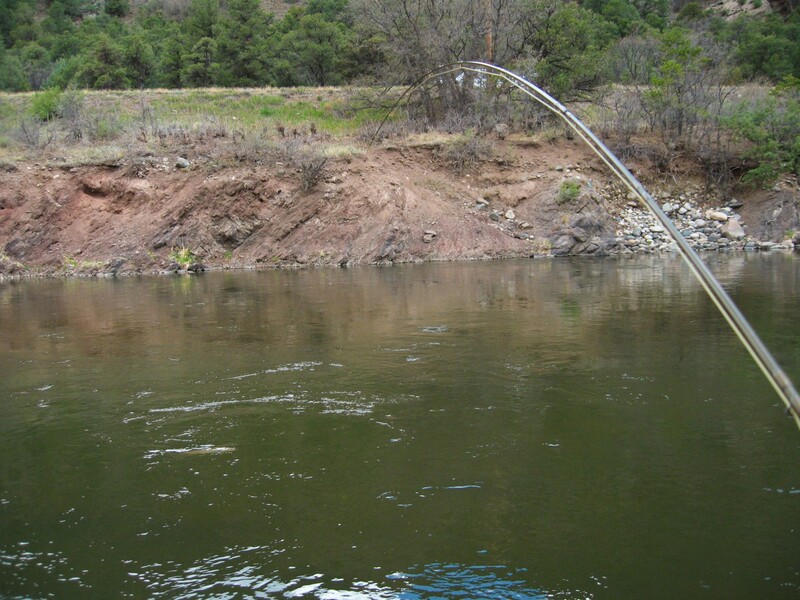 This entry was posted in Fly Fishing, Fly Fishing Equipment, Stream Report. Bookmark the permalink. 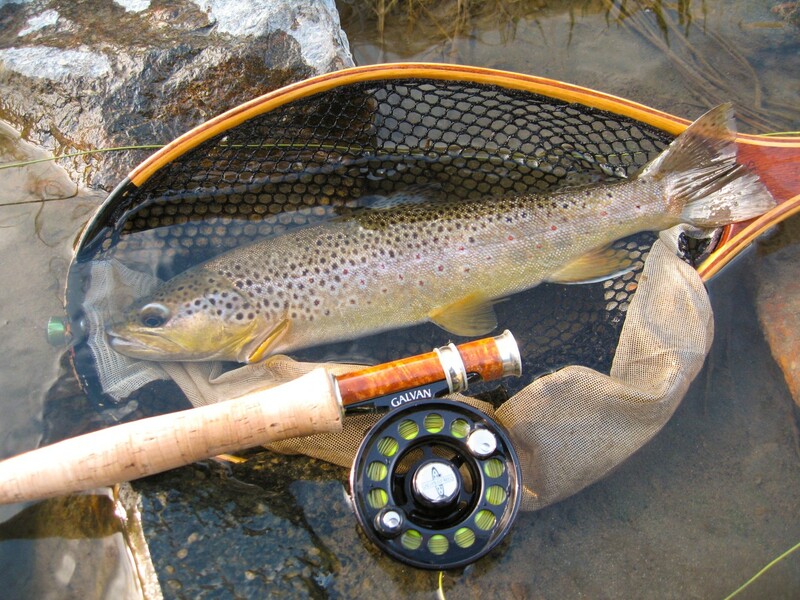 2 Responses to 3 Days Dry Fly Fishing for $300 – Is it possible? My observations of fellow fisherman on this trip to the Arkansas River provide a follow-up to the theme of missed opportunity addressed in my earlier post. For the three days that we were on the river we steadily took fish all day long, every day, by fishing Blue Winged Olive dry flies. We were constantly on the move, wading upstream, making short casts every few feet into the holding water. The Browns were primarily on the shallow side of the river, often in water only three or four inches deep; most of the Rainbows were holding around structure in the deeper channels. Both readily took the dry fly, a #16 Parachute pattern BWO. There were naturals on the water, though not in great numbers. First, the wading IS difficult. We soon learned to be darned careful of the black rocks worn smooth by the current – especially those with a film of algae (?) on them. Many were about the size of bowling balls, incredibly slick and smooth: real ankle twisters. Further, along the shoreline there were places where the silt was soft and deep enough to go up to the knee, making it quite difficult “get loose” once stuck. So, it wasn’t easy. But it was doable. Second, although there is now more readily available information about fly fishing for trout than ever before in the history of the sport, it may be that inertia prevents the casual fly fisherman from adopting a new technique. Third, many fisherman are just not observant. As I walked up a grassy bank on the deep side of the river I could see two fly fishermen ahead, standing in shallow water and throwing streamers out into the middle of the stream. I watched them for about an hour. I don’t think they noticed the Brown trout moving out of the shallow water around their feet even though the wakes were visible from my side of the river. The fishermen stomped. The trout fled. Blue Wings became visible here and there and fish began to rise in midstream, but the fishermen did not change their approach. Hello? Is anyone home? Thank you for your comment William and maybe there is something I could add in defense of those fly fishers that weren’t in the minority. It was early May and much of the publicity regarding fly fishing on the Arkansas River revolves around Caddis and the fabled “Mother’s Day Hatch”. As I noted, there were virtually no Caddis on the water during our time there and maybe those fly fishers just weren’t prepared for that. So possibly folks just can’t fish with relatively small flies although it does come back to your point about learning a new technique. They certainly missed a whole lot of fun!